There are many types of ore crushers. Jaw crushers, impact crushers, cone crushers, and roller crushers are all ore processing machinery used in ore crushing. The models of these ore processing machinery are different. There are also differences in the method of crushing. 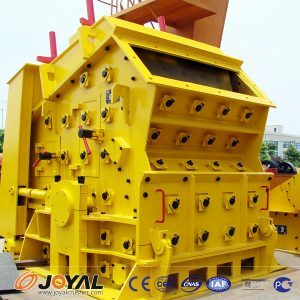 Shanghai Joyal Mining Machinery, as a manufacturer of ore crushing processing machinery and equipment, introduces several kinds of ore crushing processing machinery and equipment commonly used in ore crushing processing. Most of them are named according to the ore crushing processing method. The main structure of the roller crusher is composed of two tooth rolls with opposite rotation directions. When the tooth roll rotates, the teeth on the roll surface can bite and crush the coal block, and the feed material is fed from the upper part and is broken. The product is brought out from the lower portion as the tooth roller rotates. The cone crusher uses the working principle of the more advanced stone rock. In the working process of the cone crusher, the motor drives the eccentric sleeve to rotate through the transmission device. The moving cone rotates under the eccentric sleeve, and the moving cone is close to the static. The section of the cone becomes the crushing chamber, and the material is broken by multiple extrusions and impacts of the moving cone and the static cone. Previous: What are the machines of the sand production line?